If you've never seen pocketbikes in action, think of them simply as miniature versions of racing-style motorcycles. Their size is about one-forth the size of a standard motor bike, but accurate in detail and proportion to world-class Grand Prix (GP) bikes. In other words, pocketbikes are compact, sleek and powerful machines. Pocketbikes have been popular in Asia and Europe for years but now they are taking the American pocketbike enthusiast by storm. Pocketbike racing is the fastest growing motor sport in the country. Pocketbikes, Super pocketbikes, mini choppers, and electric scooters are all growing in interest here in the States, as more people use them for both transportation and for enjoyment. Pocketbikes are not street motorcycles. They are built for racing but intended for regular use on speedways, go-kart tracks, or closed parking lots. Use on public highways is not allowed. Pocketbikes are also not toys. They are intended for high speed racing. While these vehicles can be fun for the entire family, parental supervision is strongly suggested for the younger riders. Most pocketbikes are capable of speeds of over 25 mph. At top speeds, some bikes can even reach close to 35+ mph. However, not all makes and models are made the same. The inexpensive, off-brand pocket bikes on the market are usually of very poor quality and their performance will suffer. At MiniPocketRockets, all of our products come equipped with only the highest of quality standards. Our pocketbikes meet strict quality control standards because we only deal with the best manufactures of pocketbikes and super pocketbikes to ensure that our customers get the most enjoyment from their pocketbike purchase. Dare to compare our pocketbikes with any of our competitors. Common features of our bikes include; Race-tuned ZH-1/SY engine, multi-point hand welded frame construction, multi-coat with clear coat paint, front/rear disc brakes, racing tires, fairings, plus the styling of a true racing motorcycle. Our products are always in stock and can be shipped direct to you within 1-2 days. Click to our home page to browse our great selection of high quality pocketbikes. The pictures you'll see are real and are taken of our actual pocketbikes. You can truly see and feel the difference with our motorcycles. Here at MiniPocketRockets, we have been providing pocketbikes and super pocketbike orders online for over four years. We carry a full line of pocketbikes, OEM and racing performance parts. Any motorcycle enthusiast would agree that each of our machines is a "work of art." The pictures you see on our site are taken of the actual pocketbikes. You can truly see & feel the difference with our motorcycles. 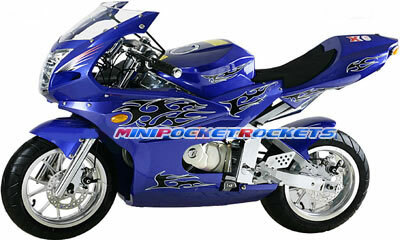 MiniPocketRockets sells a diverse array of pocketbike styles and colors to fit any unique taste. But, act soon. Our inventory of pocketbikes and super pocketbikes are selling fast. Don't be left in the dust. Hurry up and order yours today. You can be riding your very own pocketbike in no time flat.